BIAS MASTER TAD MED 4 STK SOKKELADAPTERE FOR TEST AF OKTAL- SOKKELRØR SÅSOM 6L6/EL34/6V6/KT88/6550! Measures BIAS current of any 6L6GC, 6550, EL34, 6V6GT, 5881, KT66, KT88, KT90, KT100, KT120, 7027A etc. in your amp. Includes 4 octal probes (2x BMA2) and english/german operation manual. 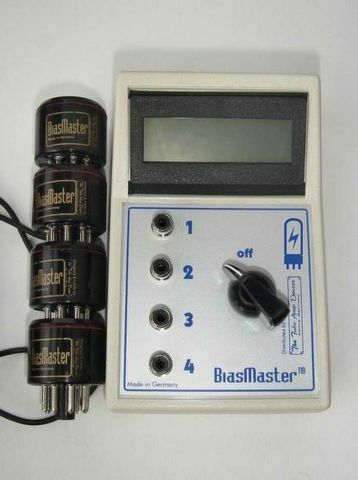 The BiasMaster(TM) allows to monitor the bias current savely and easily. While adjusting the Bias control pot of your amp the BiasMaster(TM) does show the actual result. This lets you set and evaluate all reasonable biasing range your amp and tubes offers to find and set your personal perfect choice. The Bias setting has a dramatic impact on the amps respsonse, break-up and dynamic character.